Silent star Douglas Fairbanks made a rare visit to the director's chair (accompanied by his friend and frequent collaborator Albert Parker) in 1918's Arizona. Utilizing a play by Augustus Thomas as his guide, Fairbanks fashioned another of his easterner-goes-west escapades. This time Fairbanks plays Lieutenant Denton, whose unfamiliarity with his sagebrush surroundings does not prevent him from performing a series of his eye-popping athletic feats. He saves the day at a remote Arizonian military post, much to the delight of a triumvirate of leading ladies (Kathleen Kirkham, Marjorie Daw and Marguerite de la Motte). 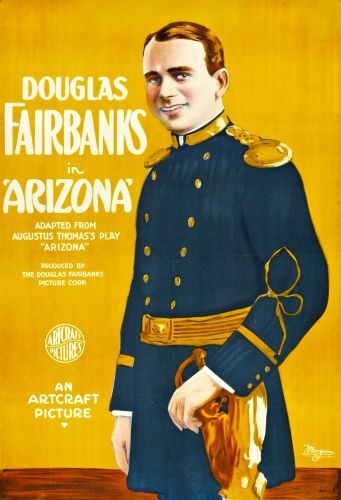 One of eight Douglas Fairbanks features made in 1917, Arizona was Fairbanks' next-to-last Artcraft release before he helped form United Artists in 1919.